This morning 196 Democratic Congressmen filed a emoluments clause lawsuit against Trump. This is separate lawsuit filed yesterday by the Attorney Generals of Maryland and District of Columbia for the same Constitutional violation by President Trump. That's basically the green light given for impeachment from the Democratic Party. A few hours later, a lone gunman began shooting in a suburban Virginia town (just outside D.C.) where Republican members of the Congress and the Senate were open targets practicing for a charity baseball game before their work day started. Republican Majority Whip of the House of Representatives Steve Scalise was shot in the hip. 2 Capital Police were also shot returning fire, plus one aid and Tyson food lobbyist were wounded. All injuries to civilians are non fatal, at least so far, but all serious enough to be air lifted out by helicopter. 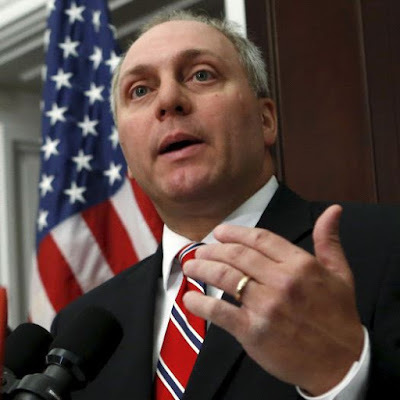 Congressmen Scalise was in and out of surgery. He's in critical but stable condition. The shooter, 66, from Belleville, Illinois, worked for the Bernie Sanders campaign in 2016. He was shot and killed. Before getting his firearm, the shooter asked two congressmen if Republicans or Democrats were practicing. He then went back to his van and got a scoped automatic weapon and opened fire. IMO, the shooting is an intentional message to the GOP not to follow the DNC lead of Presidential impeachment. There are 435 members of Congress, 196 are Democrats. Making the remaining 239 Republican. Two thirds of the House of Representatives or 292 total members are needed to impeach a President and send it up to the Senate for final judgement. Meaning, only 96 Republicans are needed to jump ship and impeach Trump. That's only 40% of total Republicans. If and when Trump is removed, many negative business and military interests will overnight lose power and influence diplomatically. It's a big, big deal to remove a sitting US President, especially one as volatile and dirty as Trump. And oh by the way... it also just happens to be Trump's 71at birthday today. This is the bad news. Tragic news. But the good news is the removal of Trump is finally upon us now, as is the Republic's public installation with Speaker Ryan. The RV release is all tied into this, and is scheduled (firm) to occur before the end of Ramadan which is June 27, 2017. Buckle up, Zimland. We're coming in for a hard but lucrative landing. Know the ZIM screen rate is well into double digits now and climbing hourly. The remaining cabal minions can't let the RV start. And they will do everything in their diminishing power to defend their insanity--which will never work, and frankly, only intensify the efforts and speed of light workers everywhere. So by all means, bring it on. Please tIghten your own noose so we don't have to anymore.